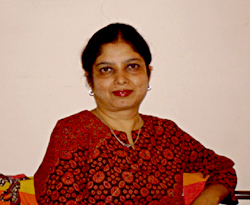 Medha Sudumbarekar was born on the 30th of August 1961. She completed her G.D. Art(commercial) from Abhinav Kala Mahavidyalaya, Pune. She has an experience of over 12 years of working in schools as a art & craft teacher. She also used to conduct art & craft programmes, workshops and classes for children. Her column in Sakaal newspaper related to the same subject became very popular. She has also worked with some social service groups and organisations which involved working with children and women from the slum areas and helping them earn their livelihood and become financially independant. She also does freelance work and painting. She has also got the first prize for a book cover design.